Giving an online presentation can be a tricky endeavor if you don’t have the right tools. Thankfully, there are lots of online tools available to help. Whether you work with a global team or you’re just working from home, the ability to present material “in person” using the magic of the Internet can make the difference between a powerful presentation, or a boring one. 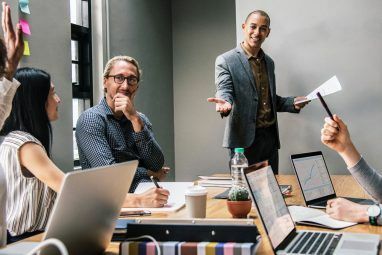 The tools presented in this article all allow you to not only share your presentation via the Internet with others, but they all offer built-in tools that let you present in real-time, while others on your team are connected and viewing your material. Any list of the best online presentation tools would be lacking if it didn’t include Google Slides, via your Google Drive account. Not only is Google Slides free, but there are built-in chat tools that let you chat with your team. To create your Google Slides presentation, go to your Google Drive account, click on the New button in the navigation menu, and select Google Slides from the list. If Google Slides isn’t on the list, you just need to select More from the menu and click Connect More Apps to add Google Slides to your account. Creating a slideshow presentation in Google Drive is about as easy as it gets. There are even a whole bunch of great themes you can use so you don’t have to build the presentation from scratch. After you finish your presentation, just share it to your team so that they can all connect and view it in real-time. Once your team is connected, they (or you) can use the Comments button to add comments to specific slides if they wish. Better yet, clicking on the Chat icon, as shown below, opens up a real-time chat window, where all team members can hold a real-time text conversation while you’re giving your presentation. If a text chat isn’t quite as interactive as you’d like, or if you’d like to deliver your presentation via voice, you can always sync up with everyone via Google Voice 5 Cool Things You Can Do With Google Voice 5 Cool Things You Can Do With Google Voice Read More and hold a voice conference while everyone is viewing your live Google Slides presentation. As many of the staff at MakeUseOf know, I love GoToMeeting. 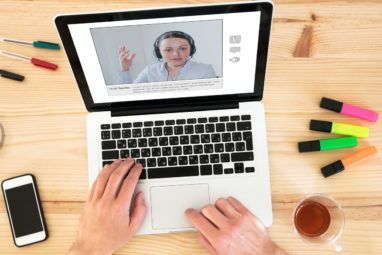 Given, it’s a paid tool that’ll cost you a small monthly fee, it’s also the one virtual meeting tool that provides the capability of meeting with the largest number of people without freezing up or crashing. Free services like Google Hangouts have a max of about ten people before you start seeing issues. When it comes to giving online presentations Make Beautiful Online Presentations With Sliderocket Make Beautiful Online Presentations With Sliderocket Read More , GoToMeeting has a unique set of tools that can help. For one thing, you can actually share your desktop, so not only can you show your team a slideshow presentation you created, but you could also show them data from Google Spreadsheets, a document from Google Docs or even show them your browser. Best of all, there are some cool drawing tools that let you mark up your screen as you’re giving your presentation. You can highlight or draw lines on the screen in a variety of colors. You can also use a special “highlighter” that glows a red dot around the screen so you can point at things for people to look at as you’re talking. Of course, if you really prefer that the tool you’re using for your meeting includes a built-in slideshow presentation designer, then you’ll love Zoho Docs. This tool is a lot like Google Drive. You can create not only slideshows, but also documents and spreadsheets if you like. Also similar to Google Slides, when you launch the presentation tool called Zoho Show, a slideshow tool we’ve covered before, you’ll find that the presentation editor is just as functional — if not more functional — than Google Slides. It also offers a whole bunch of great templates for you to choose from to get started. Once you save and publish your online presentation on Zoho Show, your team just needs to sign up for a Zoho account so that you can share your presentation with them. Once your team is online, choose the video or voice chat to start presenting your video “in person” to your whole team. Everyone can see the presentation you’ve created once you’ve shared it out to the team. Zoho Show also lets you share your Desktop just like GoToMeeting, so it’s pretty much one of the best free solutions that has everything you may possibly need for a high quality online presentation 2 Safe Ways To Share Your Presentation Slides Online 2 Safe Ways To Share Your Presentation Slides Online Read More . Vcasmo is an interesting solution for online presentations. It’s best if you really prefer the process to be as simple and straightforward as possible. Simply sign up for a free account and then enter the Presentation Wizard to build your online presentation! The way this editor works is sort of as a video stream of content. 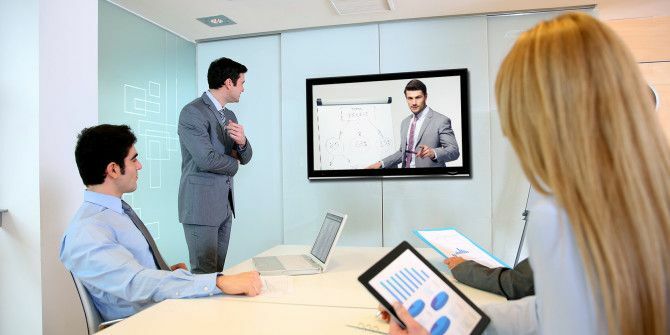 You can add video, pictures, and your own Microsoft Powerpoint presentations 4 Excellent Browser-Based Alternatives to PowerPoint 4 Excellent Browser-Based Alternatives to PowerPoint Did you know people still actually use presentation software for work purposes? It’s true! In this age of always-on cloud connectivity, more and more browser-based solutions exist. You don’t even need PowerPoint installed on your... Read More to the “timeline” of material you’d like to present. 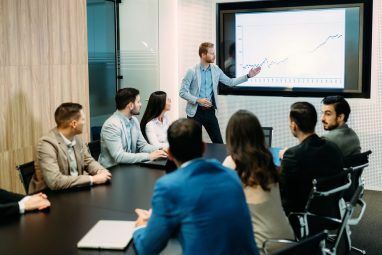 When you are presenting to your team, you can stop and start the presentation at any point in the process. Sharing your online presentation Better Than PowerPoint: 3 Online Tools for Creating Gorgeous Presentations Better Than PowerPoint: 3 Online Tools for Creating Gorgeous Presentations Whether it be for school, your professional life, or pretty much any other reason, presentations are some of the most useful tools for organizing and conveying information to others. Everyone creates them on a regular... Read More is as simple as inviting friends to join Vcasmo with you so they can view it. Again, this is a free service so it’s best for presenting to smaller teams of under ten or so people. For most small businesses, this is more than enough, and the simplicity of Vcasmo really appeals to anyone who is new to computers or presenting via the cloud like this. Another interesting and highly functional online presentation tool is a service called simply, Slides. The name is apt, because this service is all about quickly creating a simple slideshow. The editing tool provides all of the basic features you’d expect from a slideshow creator, from text and color formatting to drawing and layers. When you’re done building your collection of slides Slid.es: Create Easy And Beautiful Presentations In Two Dimensions Slid.es: Create Easy And Beautiful Presentations In Two Dimensions Part of making professional presentations comes from focusing on key points and avoiding overuse of effects. Another part comes from using the right tool for the job. PowerPoint is an amazing piece of software, but... Read More to present, all you have to do is click to look at a preview of your presentation. Once your team is connected to the service and ready to take part in the meeting, click the Present this deck button and you’re good to go. Don’t worry, you don’t have to use some third party service to share out your screen. Slides comes with a built-in live view feature. You just have to click Present Live, and share the URL with your team members. Like Google Slides, you may need an outside voice or video chatting service if text chat isn’t enough — but the ability to create and easily share your online presentation with the whole team is nine-tenths of the battle! The reality is that choosing the perfect platform for your online presentation will vary from person to person. You may need the ability to add more media to your presentation, which makes Vcasmo the right solution. Maybe you just want a way to speak while showing everyone your slides, so Zoho Show may be your thing. Or maybe you just want to do a product demo for potential clients, in which case GoToMeeting is what you should use. Start out by considering exactly what you need for your presentation, and then you can choose your tool accordingly! Are you looking for an online presentation tool? Which of the above tools are you going to go with? Is there another one that you know of that works well? Share your ideas in the comments section below! Explore more about: Online Chat, Presentations. I'm searching for one that allows me a simple way to show desktop, or slides, or whatever and narrate while I present. And that allows viewer questions and feedback and real time. I think Hangouts used to. But doesn't. Their alternative is Youtube. But I haven't found that to be easy. This didn't include what I thought would have been the most obvious choice for PowerPoint - Microsoft OneDrive. I've started using it for presentations now that it's integrated into Windows 10. I work from the copy on OneDrive while I'm at home, and while I'm away I can give presentations and make edits from the OneDrive/PowerPoint interface. Prezi is also a good tool for presenting remotely. What do you say about this Ryan Dube?